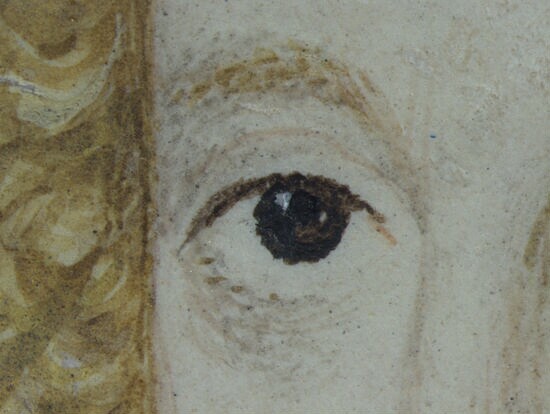 Detail of the right eye. 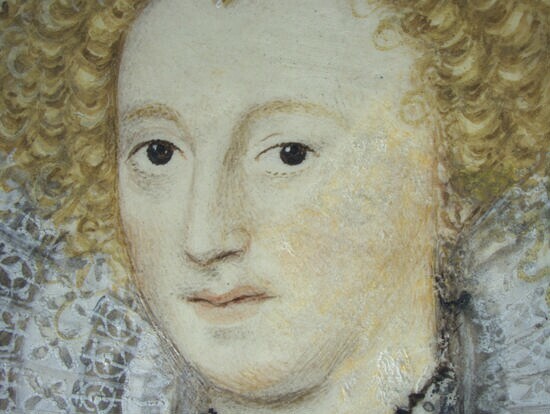 Mary Herbert, Countess of Pembroke (1561-1621), Writer and literary patron. Sitter in 11 portraits. This miniature dates from the 1590s, when Mary's literary activity was at its height. 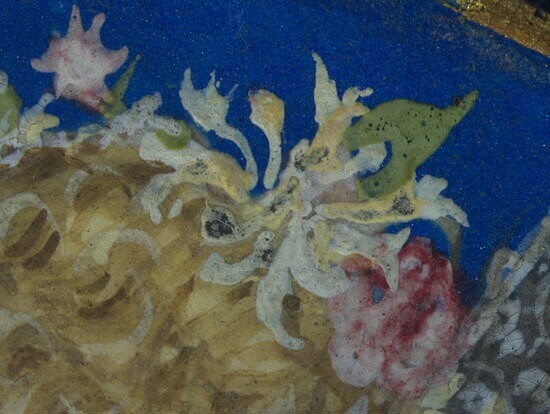 She wears a fashionable cartwheel ruff and the roses and honeysuckle in her hair and on her bodice are suggestive of summer (see detail). 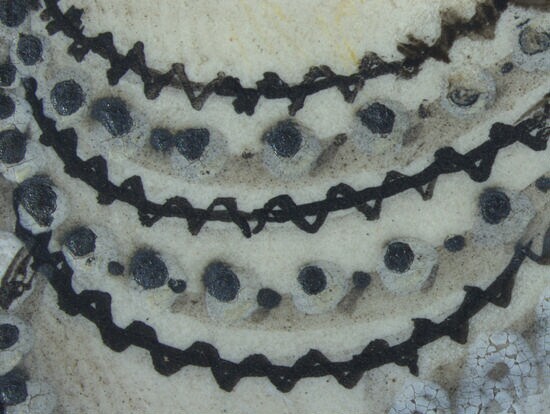 The beads of her necklace are burnished silver highlights which have oxidised over time and turned black. The portrait is executed in watercolour on vellum stuck onto a playing card from the suit of clubs. King James VI of Scotland brings his wife Anne of Denmark to Edinburgh for her coronation at Holyrood Abbey. Death of Walsingham, Queen Elizabeth I's Principal Secretary and spymaster. The colonial governor John White returns to Roanoke Island (in present day North Carolina, USA) to find the settlement deserted. The lost colonists include his granddaughter Virginia Dare, the first English child to be born in America. The courtier, poet and soldier Sir Philip Sidney's pastoral romance Arcadia is published posthumously. It is one of the first English vernacular works to achieve a European readership, with translations into French, German, Dutch and Italian. 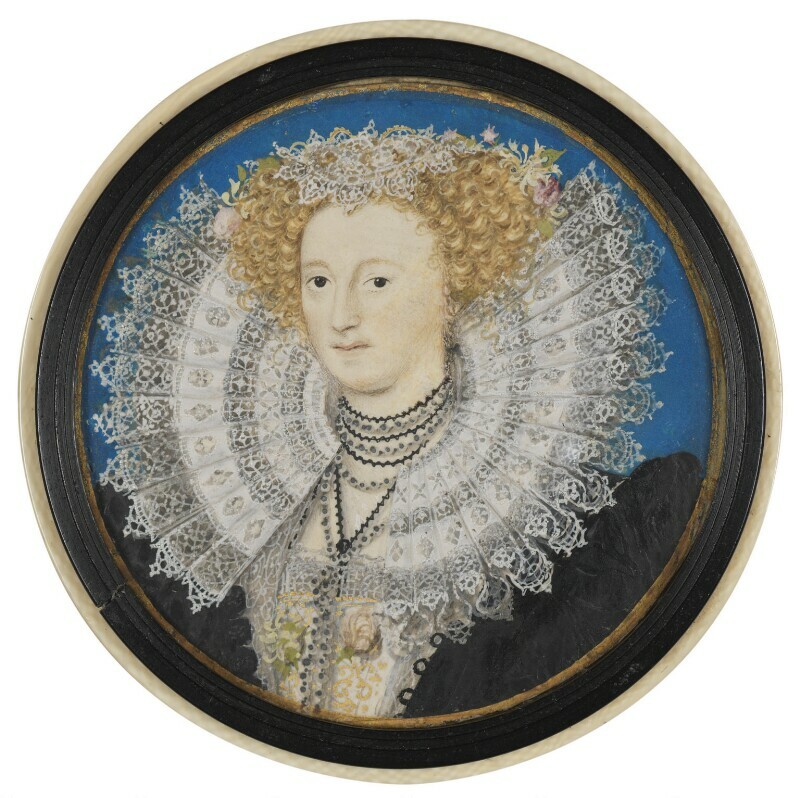 The poet and administrator Edmund Spenser publishes the first three books of The Faerie Queene, an epic allegorical poem in praise of Queen Elizabeth I.
Henry IV of France defeats the Catholic League under Charles, Duke of Mayenne at the Battle of Ivry. The King marches on Paris before being driven back by Catholic forces sent by Philip II of Spain. Abbas I, Shah of Persia makes peace with the Ottoman Empire, allowing him to campaign agaist the Uzbeks. Toyotomi Hideyoshi defeats the Hojo clan at the Siege of Odawara, Japan. The victory completes Hideyoshi's military reunification of Japan.